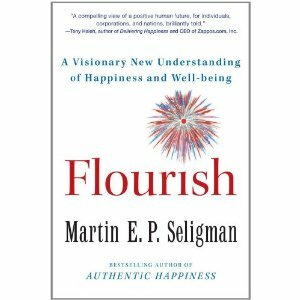 Recently, Rick Miners, my co-author/business partner/husband and I had the pleasure of hearing Dr. Martin Seligman, a psychology professor from the University of Pennsylvania speak at New York City's 92nd Street Y about his new book, Flourish: A Visionary New Understanding of Happiness and Well-being. His previous book, Authentic Happiness was a best seller and made him the guru of “positive psychology.” We read it and recommended it to everyone. In his new book, FLOURISH, he identifies the 5 important steps to finding that which we all seek---living a life of fulfillment, meaning, and happiness. He is practical and tactical and recommends some practices that are very easy to understand, but require a little discipline. For example, if you want to wake up in the morning in a better mood that will sustain you all day long, before you go to bed write down 3 things that went well for you that day, e.g. what you learned, who did something nice for you, if you did something nice for someone else, etc. He forecasts that making this a habit will lead to a happier overall existence. Is it alchemy? Perhaps, but if it works, it doesn’t matter what it is. Read his book and find out for yourself. If you get the chance to hear Martin Seligman in person, GO! or even lsiten to one of his books on audio. You will be inspired, and definitley not disappointed. You'll even learn why you do certain things and why you don't. Seligman writes and speaks in a way that engages you on every level. Rewire and FLOURISH ..now that's a winning combination for living a fun and fulfilling future! Seligman's experiences and philosophy support many of the same things we recommend in Don't Retire, REWIRE!